Well here we are, 5th and final round of the FIA Championship. We have come a very long way since the first round in May. Not only has our performance come on in leaps and bounds but so has the whole Top Methanol Dragster class! In May the class record ET, held by us, stood at 5.42 for four years and the speed record was at 264 mph. Now the record is 5.301 ET and 269 mph, both still held by us, but its not just us - along the way the old ET record has been exceeded no less than 29 times, this year by five different cars, and the speed record has gone from 264 - 269 mph and that has been exceeded by us twice more at 277mph & 279.94 mph. Never in the history of European drag racing has such an enormous performance gain been seen by so many cars over such a short period - 2009 has been a truly stunning year. Whilst we have a very outside chance at the Championship, realistically we have to aim at retaining second place and just let events take their course during the weekend. 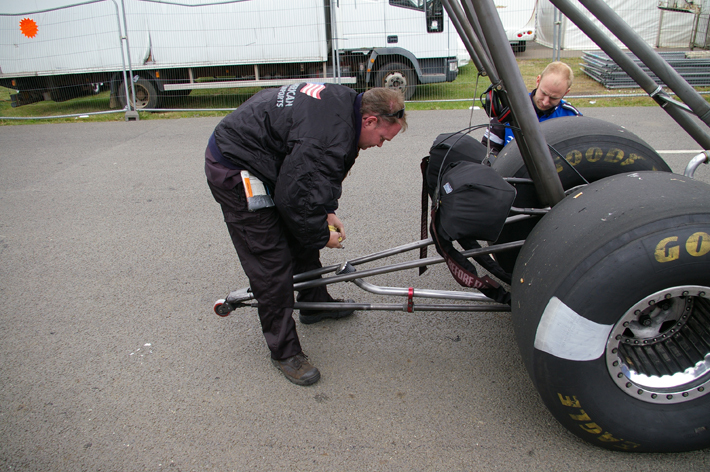 We learnt in Alastaro that we have to put an A to B tune up in the car and get down the track on the first qualifier. In Germany, we also found the first qualifier had probably the best traction for us, so we don't want to back the power down too much and maybe lose the possible advantage of a fresh track. At the hit of the throttle we moved about 5 feet and then overpowered the track again! A brief pedal on the throttle showed it had no intention of recovering its traction, so I aborted the run. That was quite a surprise to us, but this car keeps on surprising us like that, every time we get a handle on one of its problems it learns a new trick and catches us out again! We are learning more of its tricks all the time and sooner or later we will be able to second guess it better and therefore become more consistent - it's consistent performances that win Championships. On to the second round of qualifying, as more cars have made runs during the day the track has improved. We leave the line really well, the car pulls hard and then starts to shake the tyres by 400 feet - this is usually a preclude to smoking the tyres. I briefly pedal the throttle, it hooks up again and charges to the finish line. A much better result, the ET is great at 5.35 and the speed is an out of this world 279.94, so close to 280 but not there yet! Later in the session, Timo runs a 5.33 which puts us at number 2 qualifier overall, a satisfactory situation for us as we can step the power up yet and as the track improves we will be able to run quicker. Now that we are safely qualified at number 2 we can step on it in this session and find out if the track can take it, and the answer is no! We go into heavy smoke at the hit of the throttle. In that situation, when you lose traction so early in the run, there is nothing to do except abort the run and save the engine for the next qualifying run. Its now the final qualifying run and although we are quite happy with our second place it would be good to be able to repeat it for a more consistent set up on race day, and after adjustments we are halfway there. A good run for the first half of the track and then some dropped cylinders in the second half slow us down a little, but 5.37 ET @ 263 mph is a good back up for our 5.35. If you are close on performance when you start eliminations, anything can happen. It's a big day for us, not only have we got a race to run but it is also Silverline Tools Power Tool Drag Racing day in Yeovil. Every other year we have attended with the car on display and had a great day out. Power Tool Drag Racing incorporates both inside and outside competitions. In the inside competition, anything from toasters to circular saws, race on a 100ft wooden track! In the outside (funny car) competition, competitors engineer drag racers with seats, capable of carrying one or more rider(s). This sees the likes of leaf blower powered bicycles, chainsaw powered go carts and even trikes, all of which go whizzing down a drag strip at top speed - its drag racing as you've never seen it before! I wish I could be there this year - its unfortunate the championships fall on the same day - hopefully the dates won't clash next year. First round and our opponent is sidelined with a broken crankshaft, so we end up racing the first alternate in his place, Esko Raisvuo from Finland - he has an A-fuel car also and has been running this year with a lot of potential (although so far he hasn't been realised), however we are all aware he could perform very strongly at any time. Esko leaves early and fouls out with a red light (but he makes a 270 mph speed which is a pointer for the future). We run 5.38, another good, consistent time to take into the second round of eliminations. 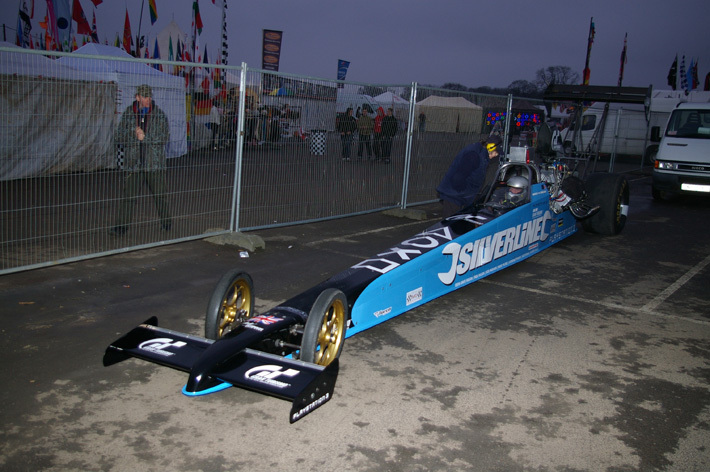 Our second round opponent was Krister Johannson, another A-fuel car and the oldest one in Europe. This car has a lot of potential and has suddenly started to perform really well this weekend. This was going to be a really tough race, especially as whoever wins could potentially go on to finish 2nd in the championship. 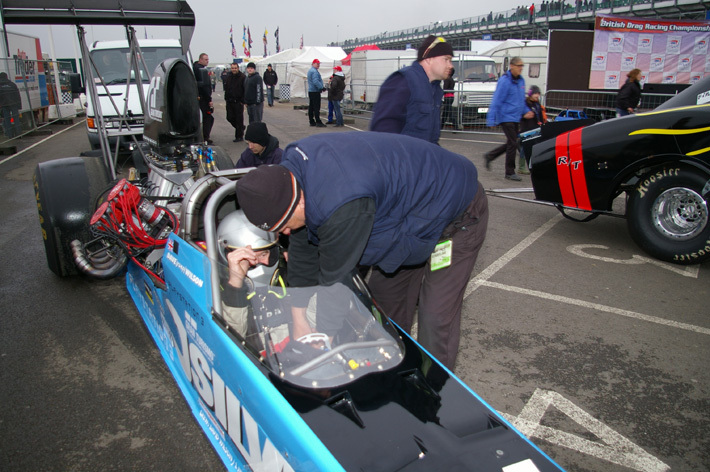 Krister is also noted to have one of the best reaction times in Top Methanol Dragster, but not this time, we leave the line and I'm first with an 0.090 to Kristers 0.122, but for whatever reason our car does not pull as it should and Krister immediately passes me. By half track I'm starting to catch him up again, although it's too late and we've lost too much time. It's quite close at the finish line with our car travelling 25 mph faster, partly due to him losing his air scoop right before the finish line. That puts him in the final instead of us - now he has the opportunity to finish second in the Championship if he can win the final. As it turns out he loses a very close race, 5.360 to a 5.366 from Peter Schofer, which gives us second place in the FIA Championship. All in all a very satisfying result for us in 2009. Now we are in a really strong position to challenge for the title in 2010. As ever, mine and the crews thanks have to go to our brilliant sponsors, Silverline Tools, without the support and encouragement from them and all our friends and fans we couldn't do what we do and be where we are. Its now onwards and upwards to next season, 2010 here we come!